"Is that going to hurt?" Here is a top 5 list of issues I see and their remedies. 1. Injections. An injection of numbing medicine can feel like a deep warm sensation but I use a topical spray that helps with the poke and a very small diameter needle. 2. Toenail removal. This creates a small wound on the skin that is under the toenail. Once the toe is numb, the procedure is over in a matter of minutes. That night, it feels similar to a scraped elbow, and It usually only lasts a few days. 3. Steroid shot. A skin anesthetic is applied before giving the medicine. Most people do not feel the poke of the small diameter needle. 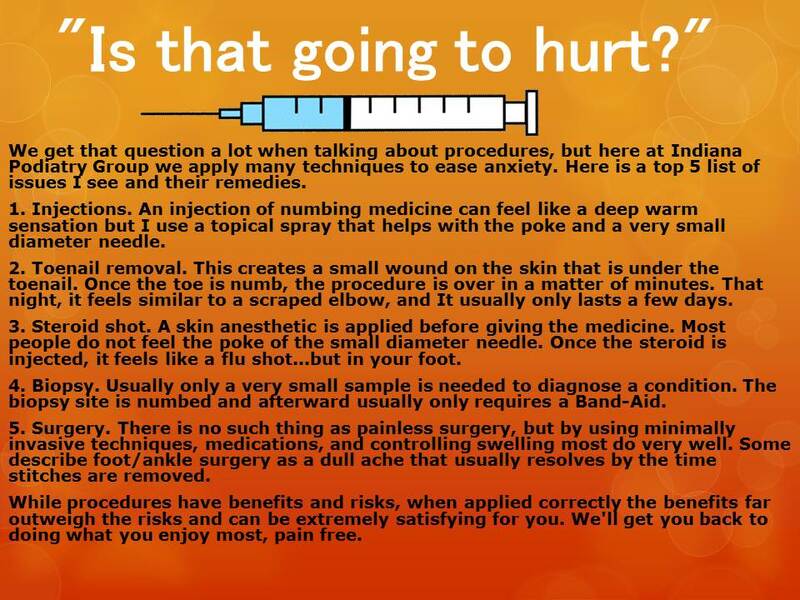 Once the steroid is injected, it feels like a flu shot...but in your foot. 4. Biopsy. Usually only a very small sample is needed to diagnose a condition. The biopsy site is numbed and afterward usually only requires a Band-Aid. 5. Surgery. There is no such thing as painless surgery, but by using minimally invasive techniques, medications, and controlling swelling most do very well. Some describe foot/ankle surgery as a dull ache that usually resolves by the time stitches are removed. While procedures have benefits and risks, when applied correctly the benefits far outweigh the risks and can be extremely satisfying for you. We'll get you back to doing what you enjoy most, pain free.